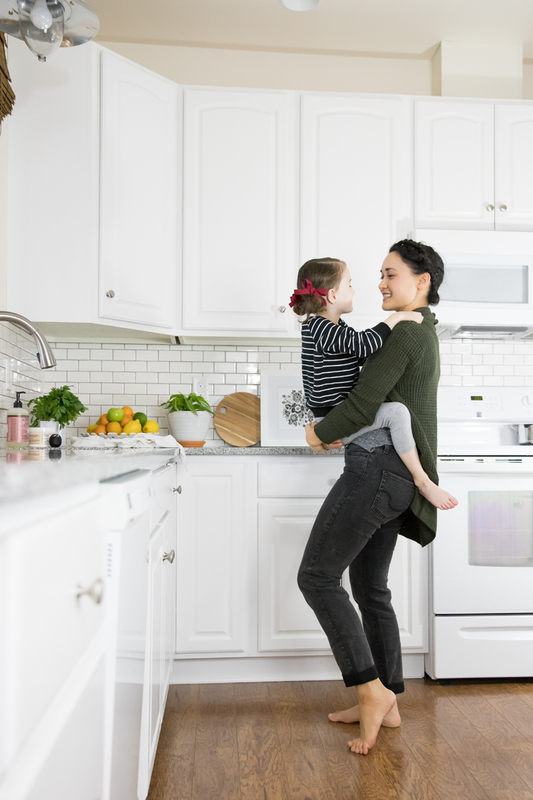 This post was created in partnership with Signature by Levi Strauss & Co. 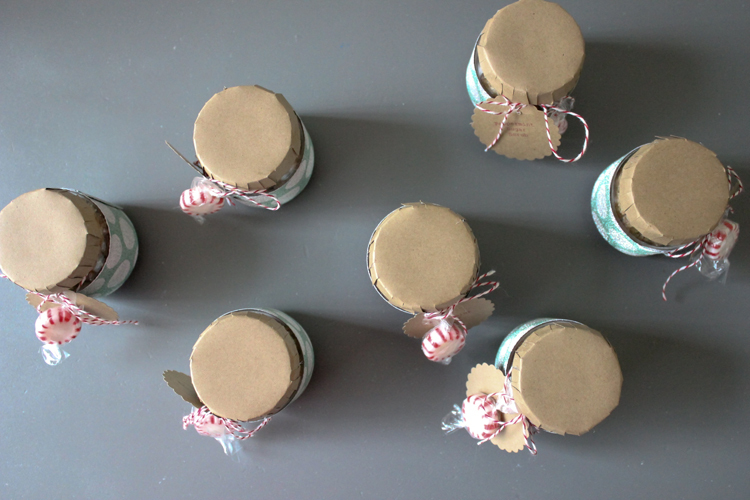 Even though the holidays are such a busy time, I love to make Christmas treats. 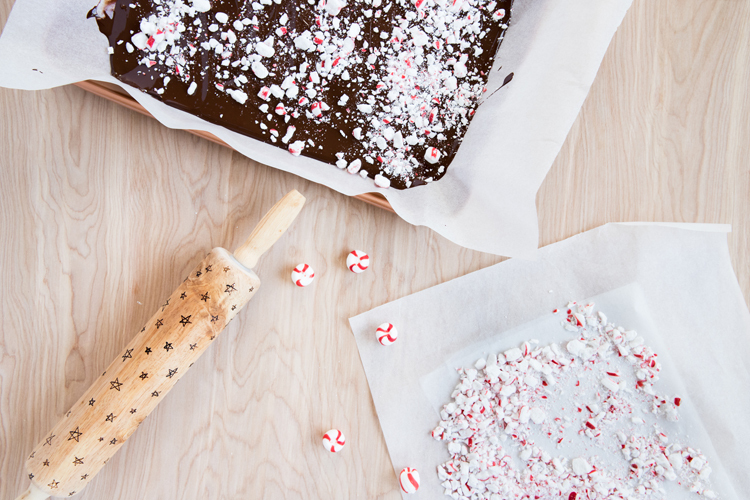 My three ingredient Peppermint Chocolate Bark is the perfect solution to that conundrum. It’s sooo easy and quick for the busiest of schedules. 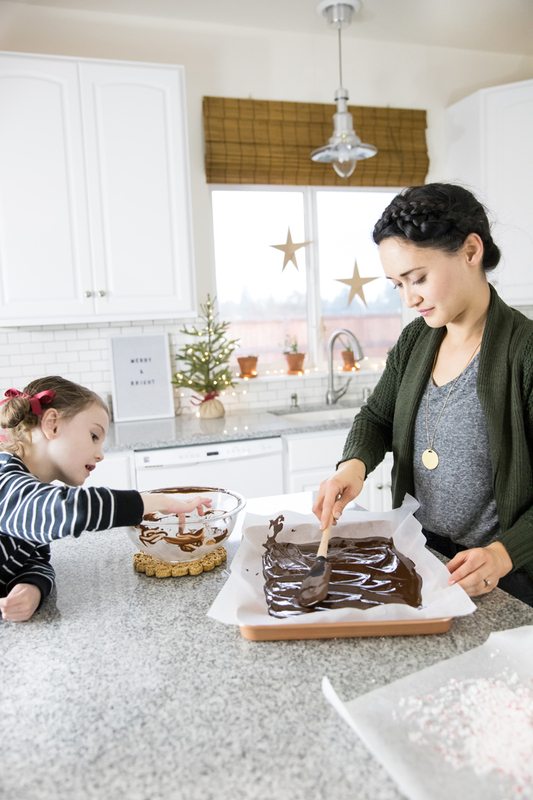 And it’s a fun, no stress treat to make with little helping hands in the mix. Plus it’s dairy free and food allergy friendly! 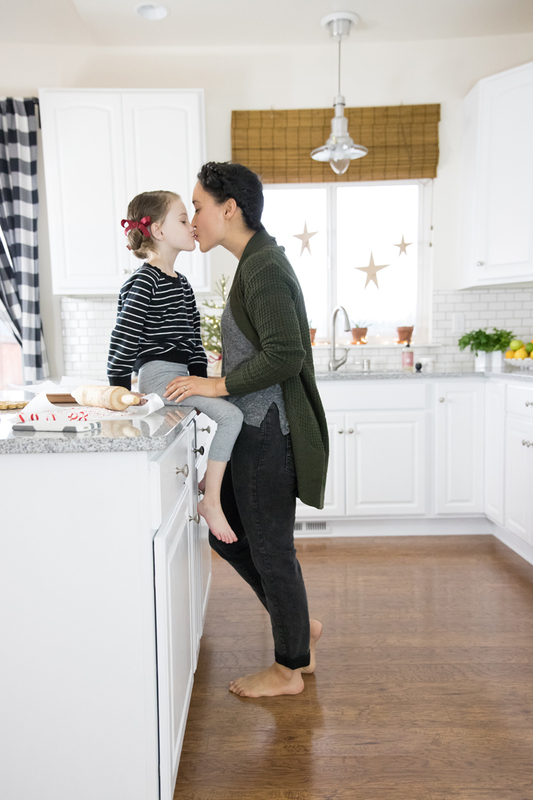 My super comfy Signature by Levi Strauss & Co. ™ Mid-Rise Slim Cuffed jeans make the perfect outfit for an afternoon of cooking and dancing to Christmas music in the kitchen. The dark wash and mid-rise waist is flattering, and the stretchy denim material makes them a breeze to wear all day. I like to pair them with casual tees and cozy sweaters for warmth and max comfiness. This outfit can easily be worn around the house or paired with cute booties for on-the-go holiday craziness! The jeans come with an adjustable cuffed hem, which is great for short girls like me! I also love the straight leg fit which is a nice break from my usual skinny jeans and it seems to be a new trend in denim this season. 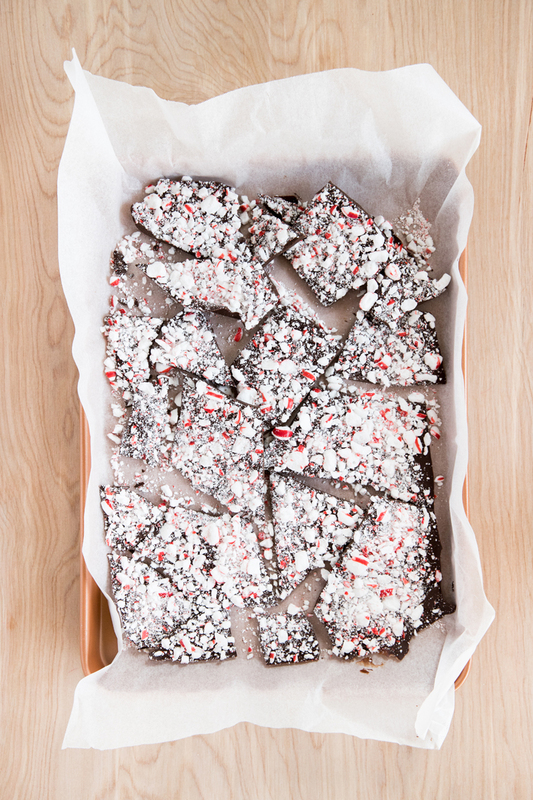 But for now, let’s talk about this peppermint chocolate bark. I have to tell you that even though there are only three ingredients, a lot of thought went into those three ingredients. So, I use peppermint puffs instead. You know, the ones that almost melt in your mouth like butter and crumble slightly when you chew them? Yesssss. 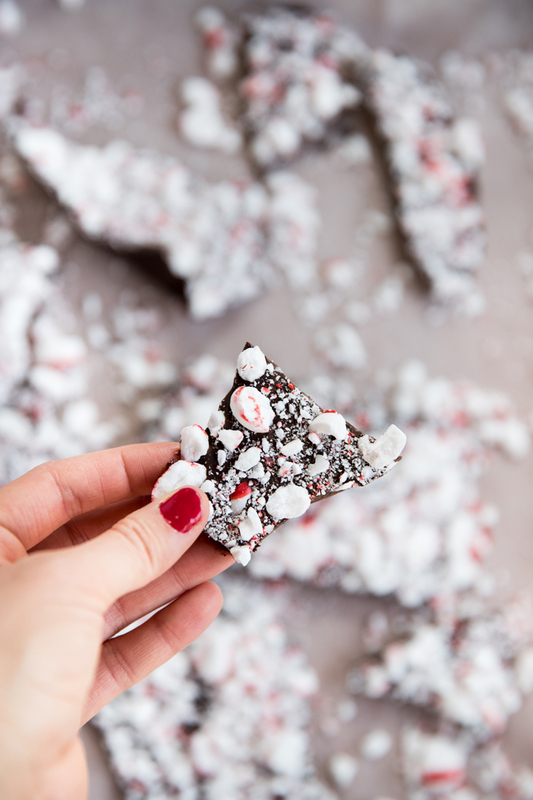 They have a much milder peppermint flavor which is great for not turning into a peppermint explosion in your mouth, so you can really lay it on your bark as thick as you want. The flavor is almost so mild that it risks getting lost pitted up against the chocolate in the bark, especially if you use dark chocolate. 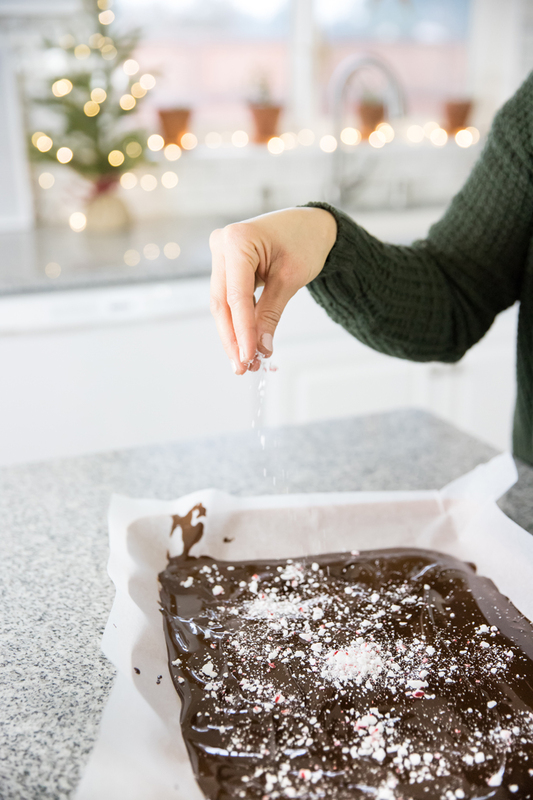 So, I threw a little bit of peppermint extract in there too and it’s…perfect! 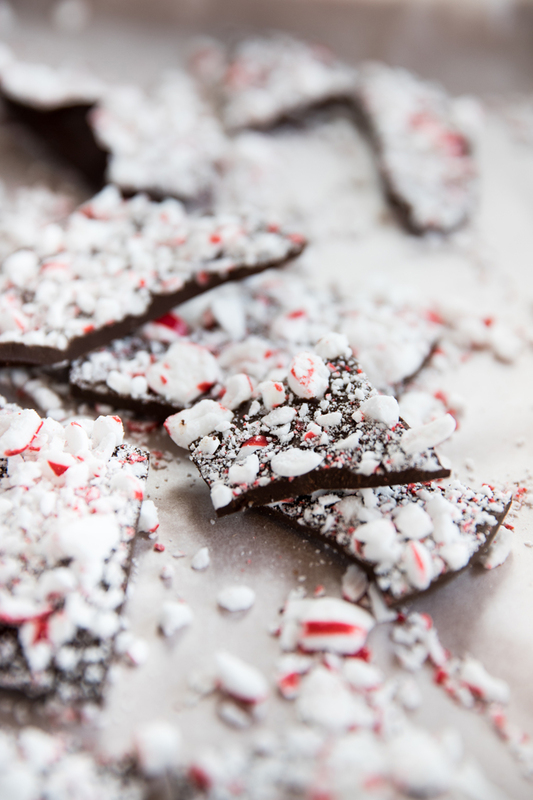 There’s a steady, pleasant amount of peppermint in each bite! *I like to use Enjoy Life Chocolate Chips. I used one bag of dark and one bag of semi-sweet. 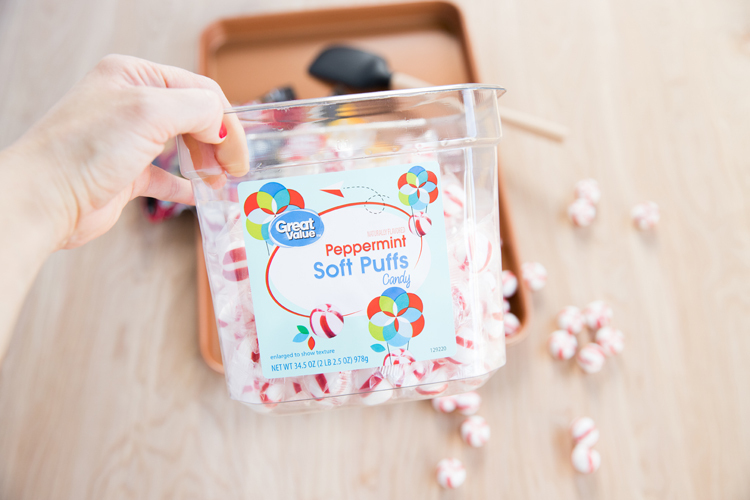 Between two pieces of parchment or wax paper, smash your peppermint puffs into small chunks. You can also pulse them in a blender. 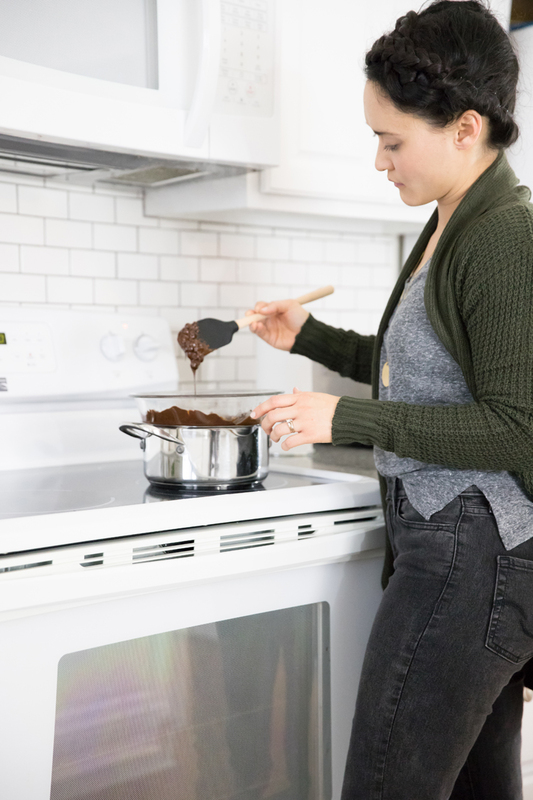 Melt your chocolate over a double boiler. I don't have a double boiler, so I nestle a pyrex bowl over a small pot of boiling water (on high heat) and it works beautifully. 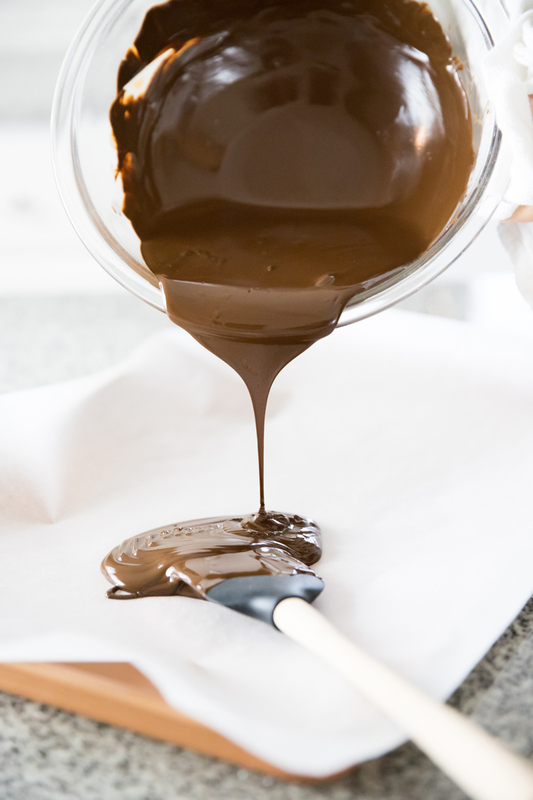 Simply add all your chocolate to the bowl and stir it with a heat resistant spatula until it's melted through. 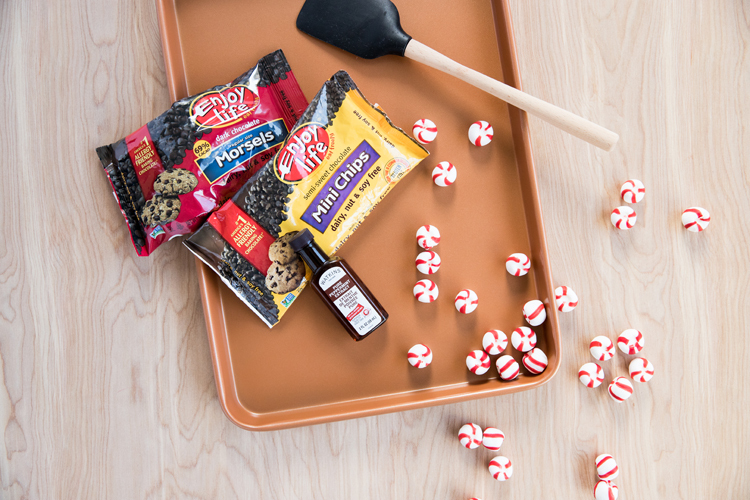 Stir in your peppermint extract until well combined. 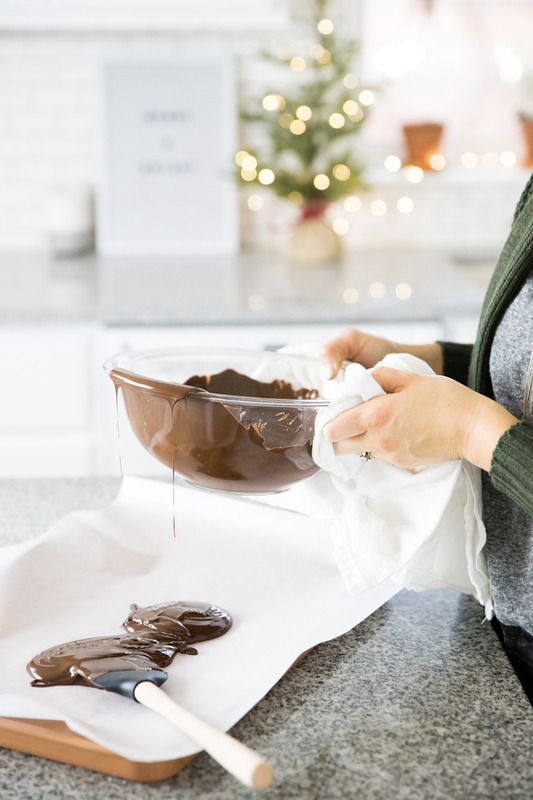 Line a baking sheet with parchment paper or wax paper and pour the chocolate on top. Spread the chocolate to about 1/4 inch thick. When it's firm, peel it from the paper and give it a nice good drop back onto the pan. It should crack nicely. Crack any larger pieces by breaking them or dropping them again. Be careful not to handle it too much or it will start to melt in your hands. It keeps best in the fridge until it's ready to be served. 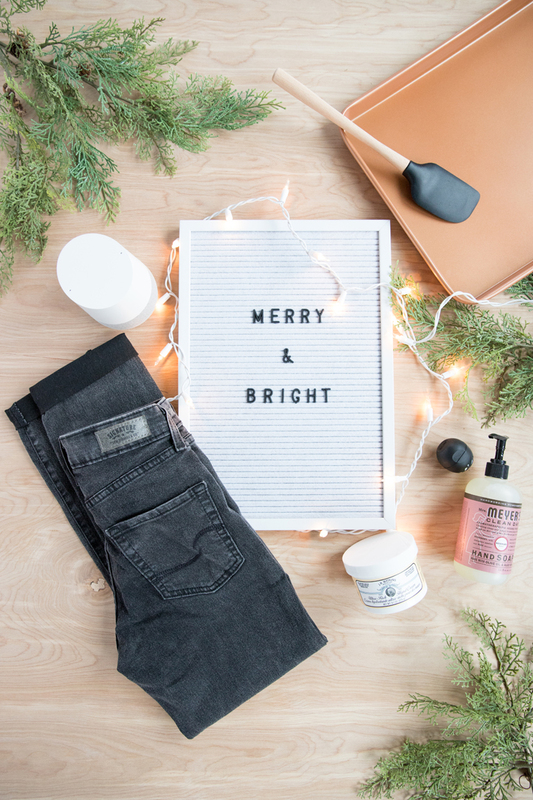 To add even more holiday cheer to this post, I’ve teamed up with Signature by Levi Strauss & Co.™ for their Win Her Wishlist Giveaway! Head over to their Instagram @SignatureJeans for your chance to win everything you see here! My baking-inspired wishlist includes a pair of jeans (of course! )… as well as a Google Home, this cute white felt letter board, a great high-quality, heat resistant spatula, a Gotham steel baking pan, and a few of my favorite seasonal self-care items, like this shimmery EOS lip balm, this great J.R. Watkins non-greasy hand cream, and the most delicious smelling rosemary Meyer’s hand soap! Peppermint Hot Cocoa Chicken Pot Pie with Herbed Pie Crust Recipe – Dairy Free! 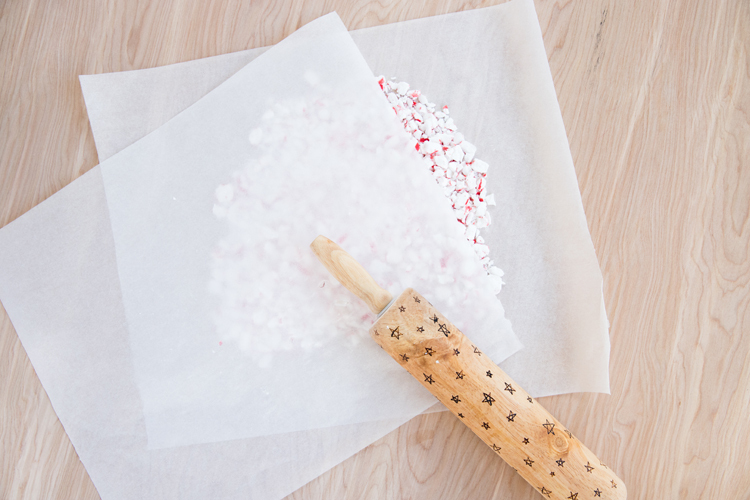 Peppermint Sugar Scrub – for kids to make! 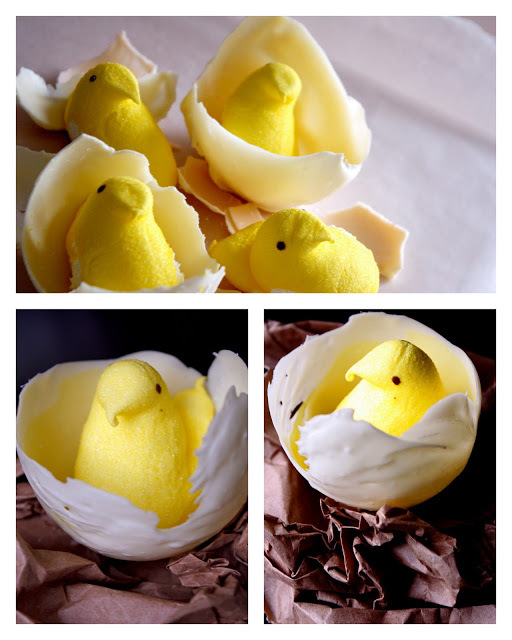 Chocolate Egg Shells Paper Holiday Houses – free templates!